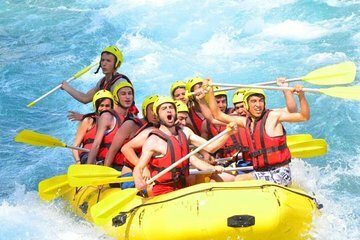 Navigate river rapids through Turkey’s Antalya region on this 1-day white-water rafting adventure from Side. Travel from Side deep into the Koprucay Canyon National Park with your guide. Pull on your rafting gear and, with your paddle in hand, head out onto the swirling river aboard your raft. Paddle hard through the choppy turns and gaze upward to the towering peaks of the Taurus Mountains above. Admire the mighty Oluk Bridge and enjoy lunch on the riverbank in the shade of cypress trees. No previous rafting experience is necessary!